Hi everyone - Allen here! As you can see from my picture, I'm a big beautiful greyhound boy with soulful eyes. When I arrived at Bristol DAWG, I was very thin and not in a very good state at all. Luckily for me, I soon found a foster place with a lovely lady called Penny and, with a lot of TLC from her, I now look a million dollars! I've put on loads of weight and my fur gleams. I walk quite well on my lead and, although I am interested in other dogs (ones which aren't greyhounds that is!) and cats, I don't go overboard with excitement. I really enjoy human company and, although I could probably live with another dog, I don't think I would mind being an only dog either. 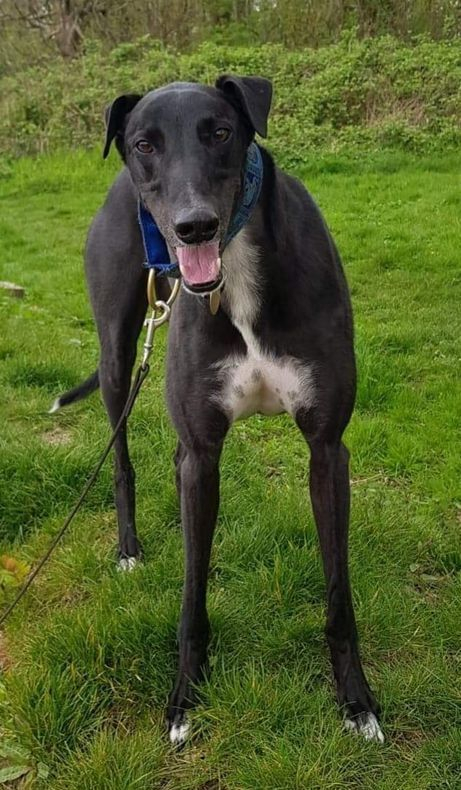 Well, the bottom line is I was in no position to go to my forever home when I first arrived, but now I'm on top of the world and looking for my very own family at last. Could that be you? Why not get in touch and make an appointment to meet me - I know you won't be disappointed. As we have limited history on most of our dogs, we usually only rehome with children eight years and over.